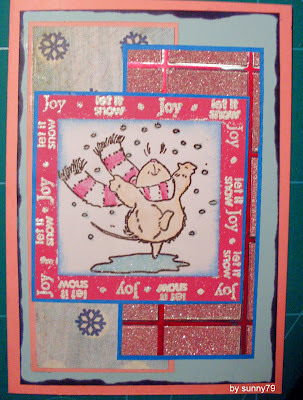 This card was first created at a "stamp against the time" (1 hour time to create a card according to a sketch) and a challenge "using unusual christmas colours" at a card...and it's also acording to this weeks Penny Black Saturday Challenge FUNKY CHRISTMAS. So enjoy this lovely colours ! So cute - I love that stamp! Lovely card very cute image. gorgeous card, love th glittery papers and cute image - perfect for the challenge. Gorgeous - love the colour and the cute image. Very cute! Love the funky colors!